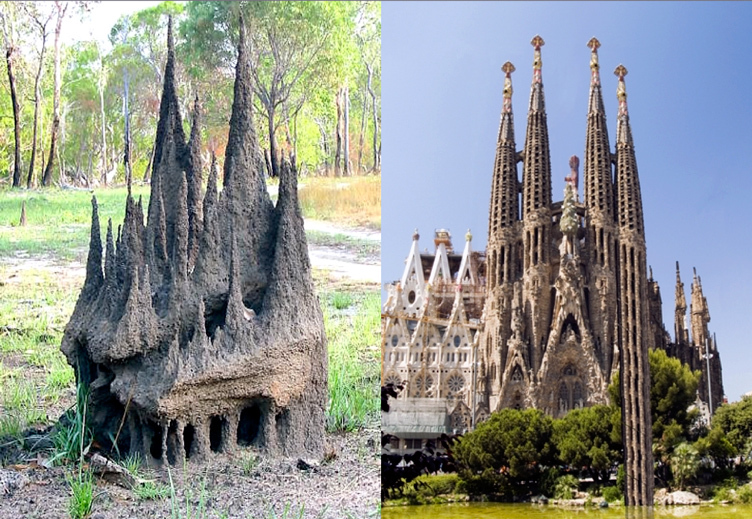 Figure 1: (left) termite castle; (right) Gaudi's La Sagrada Famiglia. Only in one species, Homo sapiens, has transmission by replication of nongenetic information taken off. In us, culture accumulates recursively, explosively, leaping thousands of miles and dozens of centuries in single steps. This hyperpotent variety of cultural evolution depends, I will argue, on language and more specifically on features of words, a category of cultural replicant found only in human beings (and, marginally, degenerately, in some of their domesticated animals and pets, such as parrots). It is words, I will argue, that make possible a novel system of design control never before instantiated on the planet, the difference dramatized by the comparison between the termite castle and Antonio Gaudí’s La Sagrada Famiglia church in Barcelona (Fig. 1). These two animal artifacts, so outwardly similar in shape, are produced by fundamentally different processes. In the case of the termite castle, “local rules generate global order,” as the slogan has it: Individual termites follow rigid rules for moving and depositing building material by detecting local pheromone signals, and no organism has, or needs, a vision or blueprint of the whole structure. In the case of La Sagrada Famiglia, there was an “intelligent designer,” an individual, Antonio Gaudí, who did have a guiding vision and did draw up plans; the control of the building flowed from the top down, through verbal representations to subordinates and thence to their subordinates. The design and construction could not have proceeded without elaborate systems of symbolic communication.